The Oba of Lagos, Oba Rilwan Akiolu, who's been in the news for publicly snubbing Ooni of Ife Oba Adeyeye Ogunwusi at a gathering has denied that happened. Recall that in a video which went viral, Ooni of Ife, Oba Adeyeye Ogunwusi, walked into a public function and made to greet the Oba of Lagos. Oba Akiolu gave him the don't come any closer sign. 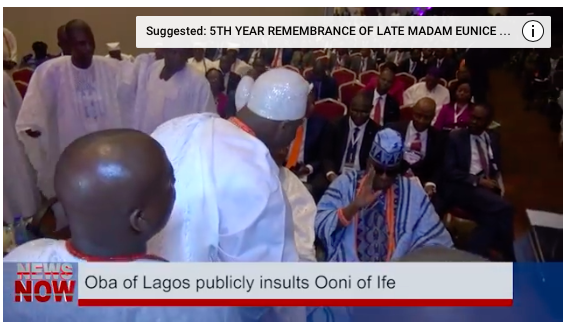 In response to the backlash, Oba Akiolu through one of his white cap chiefs Lateef Aderigbe Ajose said his gesture to the Ooni was the culturally acclaimed way of greeting a monarch in Lagos. Hahaha! The sign by Oba Akiolu signifies ‘inu mi, inu e’, the culture of greeting in Lagos. “If Oba Akiolu wanted to ignore, he would have turned his face away from Ooni. There is no sentiment in the culture of Lagos.As we met it, that is the way we are doing it.Kabiyesi Oba Akiolu is trying to bring back the old pattern, the old culture we have left behind. “What happened that day was wrongly speculated by the social media to disrupt peace and order and misinterpret Oba Akiolu’s action.We just want to appeal to the social media to stop spreading wrong information. They should try and understand the reason behind every action carried out, most especially by traditional rulers. “Yoruba has a very rich culture.